Nothing is wrong with student-athletes having the power to write their own narrative when it comes to attending a school; however, the willingness to remain with a program or stick to a commitment as a recruit is rare nowadays with players jumping from place to place. His pain was understood in the 2017 recruiting cycle when the University of Alabama did not have enough room to sign him, but there was something different about Jarez Parks. A consensus four-star, the Crimson Tide stocked up on outside linebackers/weakside defensive ends prior to gaining interest in Parks. He was No. 115 on the ESPN 300 and one of the top defensive end prospects nationally from Sebastian River High School in Fellsmere, Fla., but was faced with a tough decision. Parks could have gone anywhere in the college football landscape as a sought-after talent, yet he chose to grayshirt and wanted to give Nick Saban every opportunity. With tears in his eyes, he watched from home as his class was instrumental in delivering Alabama a College Football Playoff National Championship in 2017. After redshirting last season and the Tide hiring Sal Sunseri for outside linebackers, Parks looks to turn his tears to triumph and become a marquee contributor in the fall. 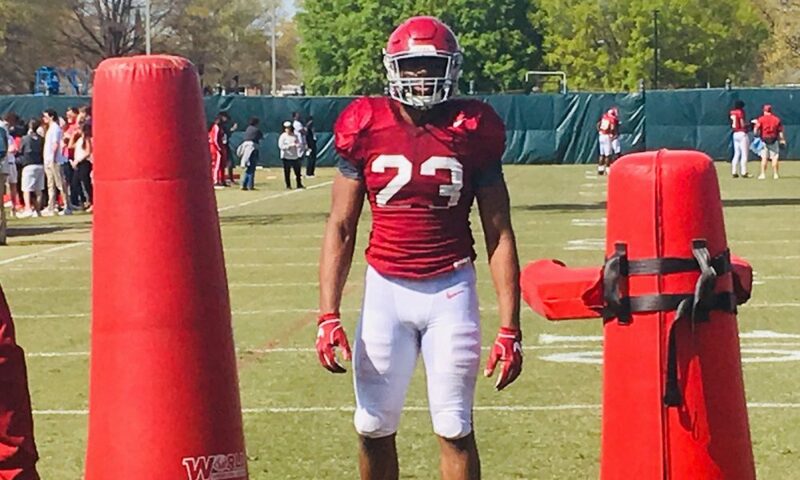 He came in at 265 pounds, but Scott Cochran — UA’s Director of Strength and Conditioning – has him slim down and chiseled up at 6-foot-5 and 239 pounds. While he did not start playing football until his sophomore year of high school, Parks is getting reps at second-team jack linebacker in spring practice behind Christopher Allen. The tough coaching from Sunseri is getting Parks ready for next season, especially with Saban not putting much on Terrell Lewis this offseason and Cameron Latu moving to offense at tight end in helping the Tide create depth at that spot. Counting its session on Tuesday, the Tide has nine more practices (scrimmages included) before it takes to Bryant-Denny Stadium for its annual A-Day Game on Saturday, April 13 at 1:00 p.m. He was a superstar at track and field upon coming to Alabama, but Parks is gearing up to be a household name on the gridiron.